At Sunflower we realise how difficult it is for new parents to entrust their baby to someone else’s care. Indeed the founders themselves, Helen and Sam as working mothers faced the same challenges in the past. We do everything we possibly can to make this transition for your baby and for you as easy and joyful as possible. Of course if you are a nursing mum you are more than welcome to come at any time to feed your baby. When your baby starts at Sunflower we will ask you to describe their routine so that we can adapt to the exact needs of your baby. All the food, drinks and nappies are provided by Sunflower. We will also help your child to become toilet trained when the time is right. Sunflower considers it a privilege to be given your trust and we are here to make your baby happy and cared for in her “second home”. Your child will be in one crèche group. Each group is named after a flower and the children are very proud to be a “daisy” or a “lilac”. Each group has a program and Montessori environment specifically designed for the relevant age group. 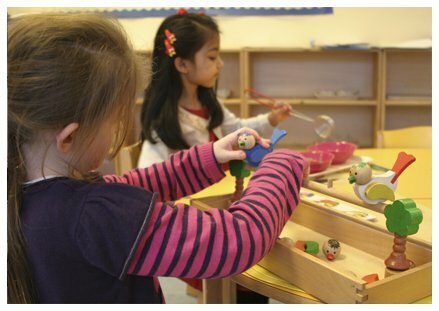 The environment is a key part of the Montessori method and is carefully designed to help your child’s development. The groups are also warm and cosy and your child will feel a great sense of security and belonging. The Montessori classroom is an environment that is prepared for your child. Your child has freedom of movement and freedom of choice. This is very important in the Montessori method as your child chooses what she will do and when she will do it. The environment is ordered and attractive. In each Sunflower Montessori classroom learning materials are arranged invitingly on low, open shelves. Our classrooms are not rooms with some Montessori equipment, we carefully plan and prepare each room so that it provides an enriching experience for each particular age group. 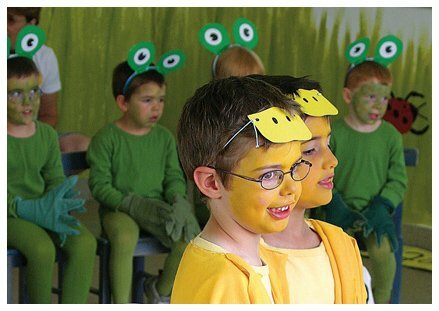 Our classrooms are environments that provide challenges and interests for your developing child. Each year we organise two musicals. A winter and a summer musical. It’s not just fun it also helps the childs’ self-confidence and boosts their self-esteem. If you would like to learn more please call: +352 26 15 93 1.